Sugar Cookies are a sweet and tender cookie with wonderfully crisp edges. They are an American favorite and although they were once made primarily during the Christmas season, they are now a year round favorite. They are delicious whether dressed simply with a sprinkling of colored sugar or frosted with royal icing. Royal icing is not the same as the confectioners' frosting commonly used by home bakers to cover cakes and cookies. Royal icing is different in that it dries to a wonderfully smooth and hard matte finish that has long been a favorite of professional bakers to cover wedding and Christmas cakes. It can be made two ways; with powdered sugar, egg whites and lemon juice or with a mixture of meringue powder and water. I prefer the taste of royal icing made with egg whites, but if you are concerned about the risk of salmonella, I have also included a recipe for royal icing using meringue powder. If you are unfamiliar with meringue powder, it is a fine, white powder that contains dried egg whites, sugar, salt, vanillin and gum. It can be found at most cake decorating and party stores or else on-line. Now, the royal icing recipe I have given is for covering or "flooding" the entire surface of the cookie. If you want to pipe a border around the outside edge of the sugar cookies (as I have done in the picture) the royal icing needs to be thicker, so it is of piping consistency. To make a small batch, beat together one large egg white, one teaspoon of lemon juice, and about 2 - 2 1/4 cups (230 - 285 grams) of confectioners sugar until the frosting is stiff (like a meringue) and of piping consistency. Color if desired. 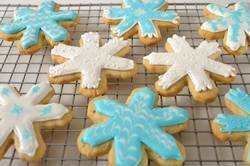 Place in a piping bag with a small plain tip and pipe a border around the outside edges of the cookies. Let it dry completely before covering the surface of the cookie with royal icing. Lastly, let's talk about which type of food coloring to use. Personally, I like the concentrated gel paste dyes that are sold in small 1/2 or one ounce (14 - 28 grams) containers. Only a very small amount is needed to color the icing, and I measure it out using the end of a toothpick. Make sure to thoroughly mix the paste into the icing as you do not want streaks. You can buy gel pastes at cake decorating stores or stores like Michael's. Note: It is important to bake these cookies until the edges are brown, especially if you are going to frost them with royal icing as you do not want the icing to soften the cookies during storing. Also make sure the baked cookies have completely cooled before frosting.